When you visit the Parts Department at Michael Hohl Subaru for Genuine Subaru Remanufactured Parts you're ensured of getting parts that meet the original specifications from the manufacturer, and that they will fit and perform like new. Genuine Subaru Remanufactured Parts undergo the same tests for quality and reliability as new parts. And you'll have peace of mind knowing they are backed by the same Genuine Subaru Parts Limited Warranty. The only real difference you might see is one we think you'll appreciate: the difference in price. With Genuine Subaru Remanufactured Parts you'll enjoy added value when you need to make repairs to your Subaru. Instead of being made of raw materials, these parts are manufactured from an existing "core" parts, allowing them to cost less and delivering you substantial savings. The process of building Genuine Subaru Remanufactured Parts begins with the actual failed or worn-out parts, or the "core". Technicians who are expertly trained will fully disassemble the core and service or replace each of the components. You're ensured of the same tolerances and specifications as a brand new Genuine Subaru Part because the reassembled core must pass all the same tests as a new Subaru part during the whole process. 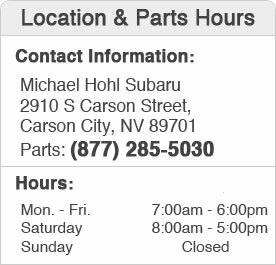 If you're searching for competitive prices on Genuine Subaru Remanufactured Parts in Reno, Lake Tahoe, Sparks, Gardnerville, or Carson City then we encourage you to visit the Retail Parts Department at Michael Hohl Subaru. Our knowledgeable and friendly Parts Specialists will be happy to help you select just what you need to have your Subaru running in top condition in no time.